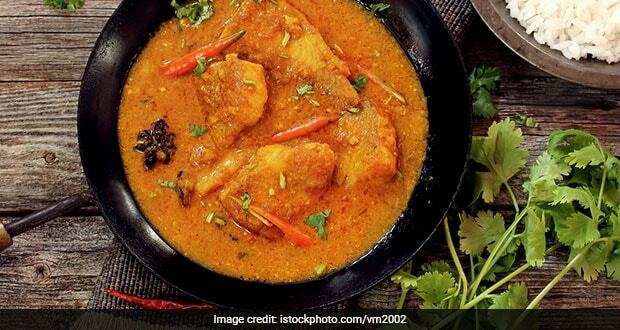 About Meen Alleppey Curry with Brown Rice Recipe: A traditional fish curry that is light and aromatic stewed in raw mangoes and infused with coconut milk. Served with steamed brown rice. 1.Clean and cut the fish into rectangular pieces. 2.Prepare the curry by heating coconut oil in a pan. 3.Add shallots, green chilli and ginger. 4.Fry this mixture till onions turn soft, and then add the powdered spices. 5.Remove from flame; add some water and cook the masala. 6.Then add dices of raw mango, salt, curry leaves and cook till mangoes are soft. 7.When masala is cooked, add coconut cream and milk, keep on slow fire and cook. 8.Add the fish to the curry, simmer till fish is cooked and adjust seasoning. 9.Serve hot with the steamed brown rice. Instead of Madras shallots, you can also use about a 100 gms of red onions.